Stuart McCloskey is hoping he will be in Joe Schmidt’s thoughts ahead of the final November Test match on Saturday. The Ulster centre has not featured in any of the previous three Tests, Ireland having defeated Italy, Argentina and New Zealand in the past three weeks. But with the Irish boss expected to go with a much changed side and include several of those on the periphery, McCloskey should be in with a shout of being involved in the match day 23 against the USA in Dublin on Saturday evening. Former Ulster centre Sam Arnold, now with Munster, is the other named in the initial squad still not to have featured so it could be a one of the other choice for Schmidt. Ulster’s summer signing Will Addison did feature in the games against Italy and Argentina. McCloskey acknowledged he was a bit down the pecking order, but remained optimistic about his chances of getting a call this weekend. “The guys ahead of me are doing really well so it is going to take a lot for me to push them out of the way,” he said. “We have been training together basically for three or four weeks, sort of the second string team. But if he does get the nod tomorrow he will be ready to help the Irish team finish the season with a bang. 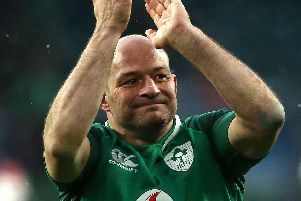 After the first ever win over New Zealand at home last weekend, Ireland can finish 2018 having achieved that, a Grand Slam and lost only once during the year. “Schmidt is just looking for us to be clinical and to bring the same sort of edge that we have brought over the last three Tests,” said McCloskey of the USA fixture. Meanwhile, Kieran Marmion faces a race against time to be fit for Ireland’s Six Nations title defence after Connacht confirmed he will undergo ankle surgery this week. The scrum-half delivered a top-drawer performance in the absence of British and Irish Lions talisman Conor Murray as Ireland toppled the All Blacks 16-9 last weekend. The 26-year-old pulled off that showing in spite of carrying the ankle problem he had exacerbated in the 28-17 win over Argentina in Dublin on November 10. “Kieran Marmion will undergo surgery this week on an ankle injury and will be out of action until February,” Connacht confirmed in a statement yesterday. Luke McGrath and John Cooney will now be in line to double up as Ireland’s scrum-halves against the USA. Sean O’Brien also faces three months on the sidelines after surgery to repair the broken arm he suffered against Argentina, leaving the Lions back-rower another Six Nations doubt. Leinster have also confirmed Dan Leavy is dealing with a neck issue and faces a period of rehabilitation, after the flanker missed last weekend’s game.Saturday’s New Zealand match with what Ireland had branded “general tightness”.